Yes, it may have made more sense to just throw the two bikes in the back of the car and drive the two miles to the bike shop. However, I find it just too strange not to cycle there so we bundled up. C was home waiting for a friend to arrive, but S decided to ride himself over, and F got drafted to come along so C could play with his friend one-on-one, something that never happens in this home. The older guys have gotten really proficient on their bikes but the sad truth is that in order for them to cycle around the city safely, they need to ride on the sidewalks. We've been taking trips downtown where P and I will cycle on the streets (with F riding on the Radish Xtra or Bakfiets), parallel to C and S on the sidewalks. We have to be in constant communication, especially when it comes to crossing streets, and I am always a bit on edge on some of the busier streets where folks could easily take a right turn without seeing the boys. Usually P and I sort of stop right in the middle of the street crossing and just block the path of cars until the boys ride right up on the sidewalk on the other side. I mapped out a route to the bike shop that I thought might work for S's sidewalk riding. We were all extraordinarily thankful for our Bern helmets with fuzzy ear coverings. It helped that the wind was at our backs for most of the ride there so we enjoyed zipping down a couple of slight hills without the need to pedal. S had an extra challenge since his hand-brake was busted (one of the reasons we needed to visit the bike shop) and he is unaccustomed to using his pedal brake. He was such a champ though, pedaling furiously, listening well, and never complaining about the cold. F, too, earned some gold stars, wrapped in a fleece blanket, sharing the cargo box with C's bike and some ice skating gear, and cheering on his brother's riding. S felt such a sense of accomplishment when we reached the Devil's Gear. There, we dropped off C's and S's bikes to get fixed and cleaned up. We also had to visit the new Madsens, of course, and F and S took a few spins around the downstairs on some kids' bikes for sale. One thing I love about bike shops is that the folks that work there never get uptight about kids mucking around a bit. 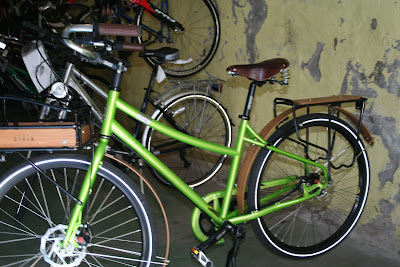 I spotted a particularly cool-looking commuter bike, a Civia, with gorgeous, simply gorgeous bamboo fenders. 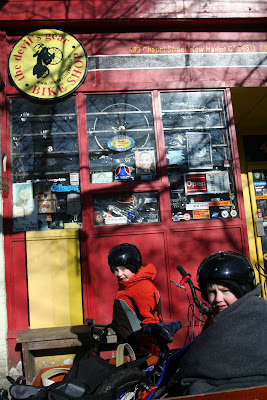 From the bike shop, both boys climbed in the Bakfiets and snuggled in close together. We decided to flip up the seat and have them sit lower, right on the bottom of the box, to hide against the wind, practically fully covered by the fleece blanket. It would have been helpful to have our rain cover, but we would not have been able to load the other bike in the cargo box on the way there. It was a bit tough pedaling into the frosty wind, but we made it to our city's public skating rink without frostbite. There, we enjoyed skating (F and S leaving the milk crates behind and skating on their own) and a snack break near the indoor fire. 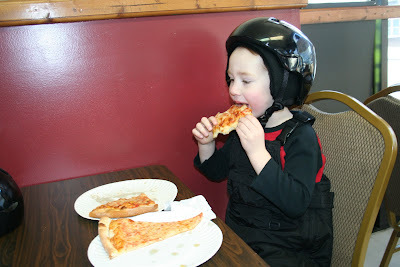 After more skating, we pedaled off and ate lunch at our local pizzeria (F with his helmet on), before heading home only to collapse and enjoy the feeling of all that we accomplished by our own pedal power. 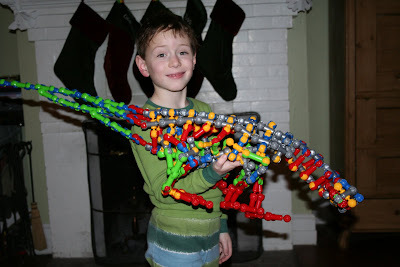 Meanwhile, look what C was working on at home while we were out.... a Zoobasaurus! I can't help myself. 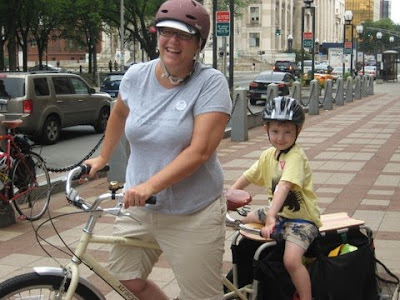 Once I learned about cargo bikes, I became obsessed-- coveting one for months, searching owners down through the web, visiting every site I could find that mentioned cargo bikes and family cycling. 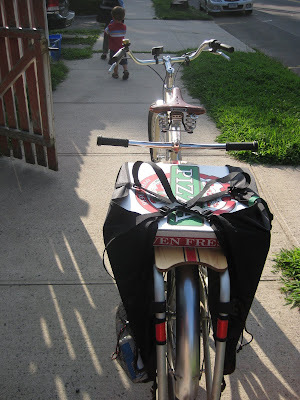 Once we got our first one, the Bakfiets, my obsession took on a whole new level, constantly pushing limits to where we could ride and just what we could carry on our bikes. I realize that I may bore some with my talk about our bikes and cycling adventures, but ultimately, I admit-- I don't really care. We own one car so I am not a total car hater and never admonish others for driving. I just love our bikes and love that we can get around quite well through pedal-power. 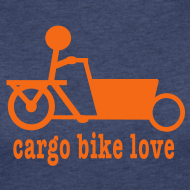 And now, I love that others around me are interested in cargo bikes, as well. First off, I want friends to share in our fun. Secondly, I know that the more cargo bikes that are out on the road, the safer it is for all of us cyclists. So I was thrilled when, out on our bikes yesterday for the first time in over a week (thanks to a big snowstorm), we ran into Matt, the owner of our favorite local bike shop, The Devil's Gear. Matt decided to ride home with us so the six of us chatted as we pedaled along and he shared the news that The Devil's Gear is now a Madsen dealer. Rock on! I am so pumped that a local shop is now stocking cargo bikes. The shop currently has five and plans to use one as a renter. I really believe the time is right in New Haven and there are folks locally who will definitely be interested. 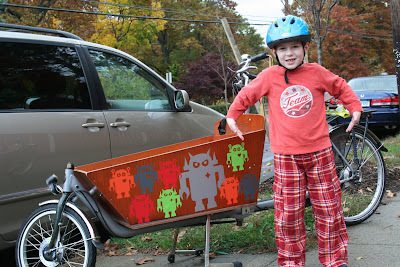 I immediately came home and called my friend C, who has been cheering on my cargo bike obsession. 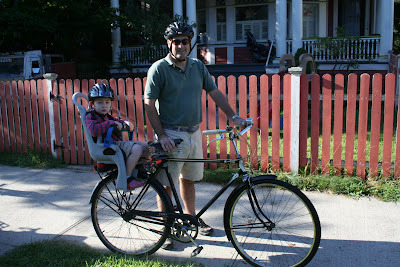 She, in turn, has already contacted Matt about taking a Madsen out for a test ride. And now Emily at Wheelsonthebus, has caught the bug. Cargo bikes all around! 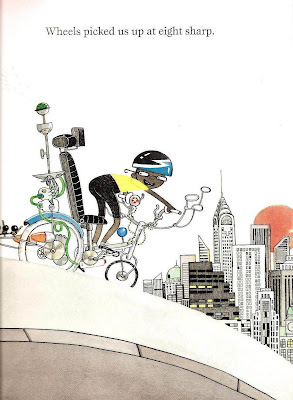 I found another fictional bike hero (like Anna) recently while reading with my boys. We've become big fans of the artist/illustrator, David Roberts. Last year Iggy Peck, Architect was perhaps our favorite picture book, and this year we've thoroughly enjoyed The Dunderheads. I was relieved that one of my son's commented that "teachers in books are not like teachers in real life. In books, they are mean, but that's not true in real life." Wouldn't that be wonderful if he could maintain that perspective in his many years of schooling to come? And later in the story, Wheels moves his classmates' revenge plot forward... literally. 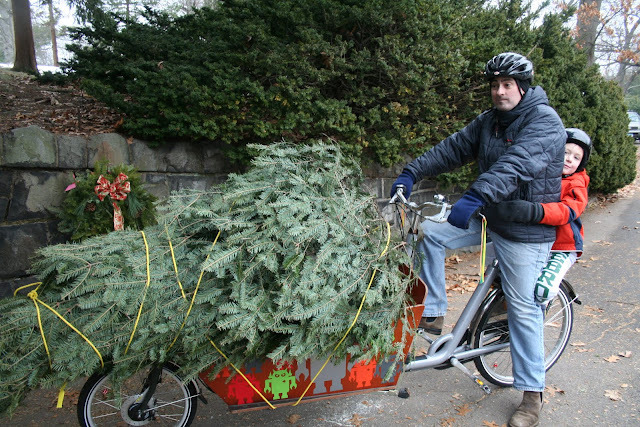 When I first began investigating cargo bikes on the web, I was really jazzed by photos of folks hauling Christmas trees by bike, like this one and this one. 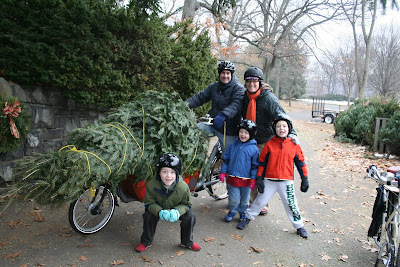 Since we became cargo bike riders, I now obsessively read other family bike blogs and this year, I was excited by all the posts duplicating the feat of carrying one's tree home by bike, like here, here, and here. I immediately began to fantasize about taking on the carfree adventure of getting our tree. One issue, however, was that ever since we moved out of NYC, we made it an annual tradition to cut down our own tree. In Maine, we actually lived right down the road from a Christmas tree farm so that was an uncomplicated venture and here in Connecticut, there are loads of places in the surrounding area to cut down a live tree. However, there are really no Christmas tree farms close enough to which we could cycle. 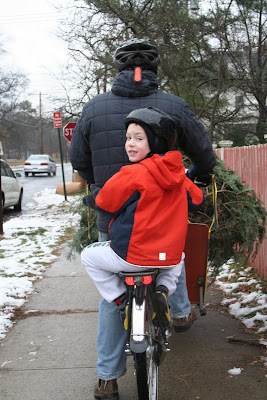 So we were left with the dilemma: drive and cut down our our tree or cycle and pick out a pre-cut tree. I just couldn't get the image of the tree on a bike out of my head though so I pushed for the latter. So today, we climbed in/on the Xtra Radish and Bakfiets and set off for a local park. I felt pretty good about buying from the folks here because they run a program for adults with developmental disabilities and the proceeds of the Christmas tree sales were going there. We had quite a family discussion about which tree would come home with us. Everyone got a vote and not everyone was particularly pleased with the results. However, a choice was made and the tree was bought. Now the question-- how to load it on a bike. Before we left the house, we had thought we would lash it to the side of the Xtra. However, at the park we realized that they didn't have a tree 'wrap' thing, which, of course, is better environmentally not to have that extra plastic holding our tree bound, but somewhat of a conundrum when trying to figure out how to lash a particularly fat and tall tree (little boys votes, remember, I would be pretty happy with a Charlie Brown tree myself) on a bike. The guy running the tree sales offered to deliver the tree to our home, but I felt that would defeat the whole point of the mission. I wanted to get this tree home by bike. 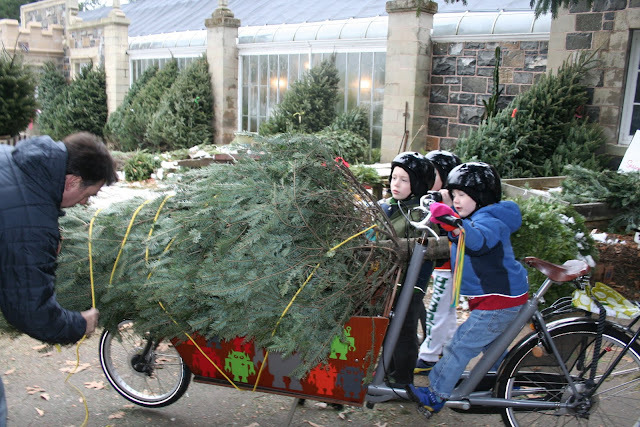 In the end, we simply loaded the tree on top of the Bakfiets. P, who is particularly good at knots, lashed the tree to the cargo box. The box now was well filled and we needed to get everyone home. Two of the boys could climb on the snapdeck of the Radish, but we still needed a spot for one more passenger. S volunteered ride on the back rack of the Bakfiets and it worked out quite well. We, of course, got lots of attention cycling to our apartment. All hurt feelings about wanting a different tree were forgotten as we rode along and sang carols at the top of our lungs. Even though rain started to fall, our jolly moods were not dampened as we made our way home. Walking up the steps to my office in school today, a parent stopped me to tell me that "they were talking about your bike on NPR this morning." I immediately booted up my computer to check it out. Love NPR and it was exciting to have this love collide with our bikey love. Ironically, I must admit that since my family began bike commuting, we listen to far less NPR. It used to be the go-to radio station when driving and we tend to listen only to music CDs when we are home. 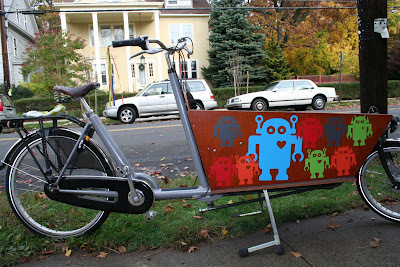 I was really happy to find the story here and see that the wonderful Portland-based bike shop where we bought our Bakfiets was mentioned. Cool! "I am thankful my books because without them I woud not be abel to read. I am thankful for my bike because without it I woud not be abel to ride a bike. I am thankful for hollidays because we get toger. I am thankful for Earth because we live here." 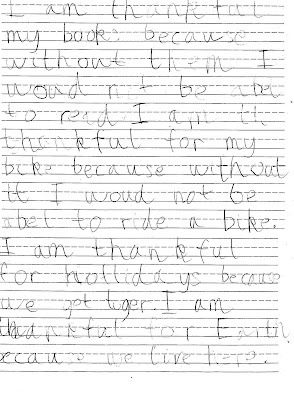 I am most thankful for a son who considers books, bikes, getting together at holidays, and the Earth all things for which to be thankful. When we began bike commuting, we didn't have any specific intentions to become a carfree family. Instead, we wanted to remain a one-car family and figure out how to get two miles to work and school without using that car. However, as we began doing more errands by bike, we realized just what more we could do by bike. 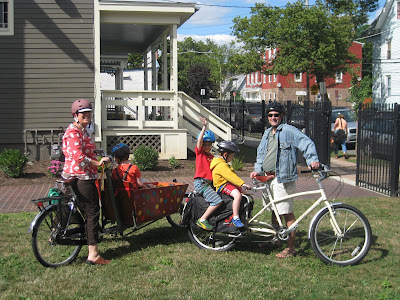 Investing in the second cargo bike, suddenly made us a truly carlite family as we could divide and conquer and still get the three boys where we needed to go using two wheels (or really four wheels, I guess--on two different bikes!). Since February, it has been a rare day we did not ride somewhere. I don't mean to suggest that we never used our car-- we did-- but at the very least, one errand would be accomplished by cycling instead of driving. Suddenly, a whole week would pass and we would realize that the car sat dormant against the curb without being driven for a whole week. I've never tracked it, but it would be interesting to see the longest consecutive period of carfree days has been for us. Most days, riding has been joyous. Lately, it has been a bit of a slog. Yesterday, we had the rain cover on and two squirmy, complaining boys and some darn tired legs. I don't think it helped that it was grey out and some more bad news greeted the local cycling community here. It just felt like it would have been so much easier to drive, but the truth is, since we began family bike commuting we've actually discovered that most times, it is easier to cycle. For instance, we spent all weekend here and there, but doing it all by bike. I took the two older guys downtown to see Tap Dogs and it is so wonderful to be able to pull up right in front of the theater, hop out, engage the internal lock, and walk in with no worries about lines (and cost) of dealing with the parking garages. Sunday mornings, it's become a fun ritual to cycle together to church and then head out to a local coffee shop for good lattes and yummy baked goods. We even braved the car traffic to visit a friend in the neighborhood where this was happening. I couldn't help but think that all the fans should be traveling there by bike. I read some crappy news about our favorite local bike shop on Thursday. Then, on Friday, we woke up to rain. 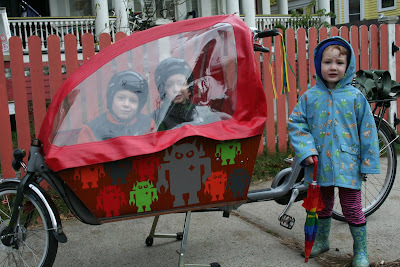 Discussing it with the boys, we decided to break out the bakfiets's stylin' red rain cover for the first time this school year. I set up the cover, got it all adjusted, and S and C climbed up and under. They were looking so darn cute, I had to go back in our apartment to get the camera to capture the moment (plus, gotta think ahead for that blog post, right?). As I was lining the boys up, snapping away, a neighbor walked by, hesitated and said, "Uh, that is your car, right?" pointing to our desert sand-colored minivan (yes, that is the color Toyota named it). She proceeded to point out that one of the back windows streetside was all smashed up. UGH. 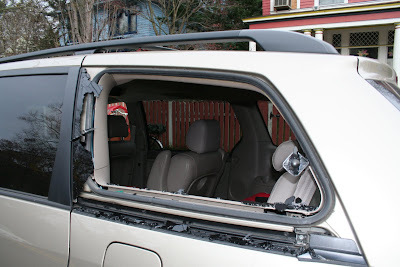 It seemed like a pure act of vandalism, or I guess the smashers weren't particularly interested in stealing three booster seats and a bunch of kids' books. I remained calm through it all. Even though I was bummed, we've been parking on the street for over two years and this was our first broken window/possible theft. 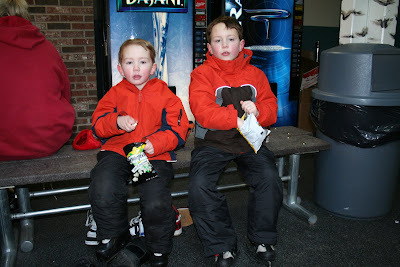 The boys, however, got very quiet and solemn and even a bit teary. It was as if they just couldn't believe anyone would ever do such a thing. "Oh well," I soothed, "These sorts of things can happen sometimes when you live in a city, but think of all the great things we get to experience here, too." Remember, these were the kids who spent four years in rural Maine and were outraged when we started locking our front door when we moved here. And then we took off, pedaling to school. By the time we arrived, their moods had lifted significantly. And yeah, windows can get smashed anywhere. Aren't we lucky we get to bike commute to school together? It's remarkable how much stir a bicycle helmet can make. No, I am not talking about the debate about whether folks should wear them or not. I wear one. 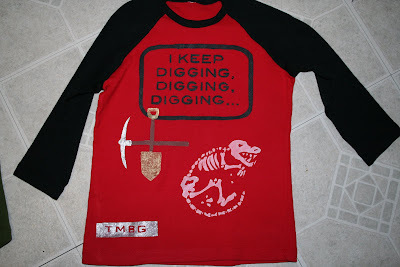 I make my kids wear them. Do whatever you want, but don't argue with me about it or try to sway me to take off my helmet. Last week, I spent two days at a conference. It was a relief that this year the conference was held in a city not far from my own since last year I had to travel to Boston for a couple of days. Now, I like Boston, but at this time of year, I find it extremely difficult to be away from my job and my kids for multiple overnights. So while the idea of luxuriating by myself in a hotel room (a.k.a. going to the bathroom without anyone barging in) makes me salivate profusely, the truth is that getting away right now is more difficult than the pay-off seems to be. Therefore, I appreciated that this year I could commute to the conference from home and even stop into the office if necessary. The question I batted around with my colleague, who was also attending, was just how we were going to get there. It's a pretty convenient train ride to this other city so that seemed like the obvious choice, but there was some concern that we would have far less control over our schedules and there were logistical questions of getting to the train station from home and getting to the conference site on the other end. While I do own a car, I did not offer to drive. Since we are a one-car family and I was leaving P with the juggle of getting three boys to different places and some prediction of bad weather, I thought it best to leave him with the four-wheeled beast just in case. My colleague, ultimately deciding that she would like the convenience of deciding our own departure times and not be beholden to Metro North's schedule, offered to drive us both. I was actually quite pleased thinking that this would be far-and-away the easiest thing for me. I wouldn't be the one driving AND I didn't need to figure out the logistics that would require multi-steps and some advanced planning of getting there not by car. While I hunkered down at work and skipped the first day of the conference, a newcomer's session, my colleague headed south in her car. Unfortunately, right before she reached the conference site, she ended up in a slight accident that thankfully caused no injuries, but did some damage to her car. She did not feel comfortable driving it until it was fixed so that evening by phone, we plotted a Plan B. Yes, we would take the train. How would we get to the station? Well, I couldn't ask my husband to wake up three kids at 5:20 AM and drive us there (nor could we leave three little sleeping boys home alone). Yes, we could call a cab. Or simply-- we could ride our bikes. We arranged for a meeting time and place and the next morning. 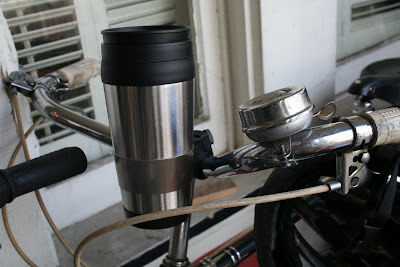 Far earlier than normal, I strapped on my bike helmet, loaded my Xtra with my laptop and work bag, dropped my travel coffee mug into its brand new holder on my handle bars, added some good lights to my bike, and pedaled off. I must admit that I was cursing myself a bit here. Because we were taking the train, we needed to leave earlier than I thought we would had we been driving. And because I was riding to the train station on a bike on a day where some bad weather was predicted, I had to think a bit more about what I would wear and bring with me to accommodate the time and weather. The weather turned out to be brisk, not horrible, and thanks to Daylight's Savings Time (ugh, I hate it in the evening), it was fairly light out. The streets were mostly quiet but it was interesting to see who was out and about at that time of the morning. Not too long into my ride, I met up with my colleague on her bike, and off to the train station we went. Two sights particularly grabbed me on those two morning commutes to the train station. The first was a large group of construction workers streaming out of a huge, multi-leveled parking garage on their way to work, building a huge, multi-leveled parking garage a few blocks away. The second sight caused me far more delight: a gentleman wearing a jaunty beret, riding a tandem bike alone with an accordian strapped to his back. I so wished I had a camera to capture him, pedaling along. I couldn't help but wonder who he was and where he was going. Who normally rode that bike with him? And just what was the deal with the accordian? I wondered if I would have really seen him, I mean really seen him, if I were traveling by car. The ride to the train station turned out far easier than either of us expected. We found open bike parking and locked our bikes together. We then unclipped our lights, threw them into our bags, and strapped our helmets to our bags' shoulder straps. We bought our tickets with little fuss, waited a bit at our assigned platform, jumped on the train, and made it to our destination city likely more quickly than we would have in a car (bad traffic). We were able to walk from that station to the conference site quite easily, and there we began our workday, sitting at a round table for the next many hours in a room with ugly chandeliers and no windows. Oh, and the thing that caught me so by surprise-- the number of other attendees who stopped us during the two days of the conference to ask, "Were you the ones who came in with the bike helmets?" While there were a number of people who came from out-of-state and were staying at the conference site, there were plenty of Connecticut-conference-goers as well. Folks seemed pretty darned surprised that 1). we took the train and 2). we rode our bikes to the train station. Wow, we do live in a car-centric place. I am not a chic cyclist. I don't say this to be self-deprecating. It's just a fact, and the truth is that while I so enjoy seeing blogs of stylish women cyclists, I don't really aspire to fit into this category. I have never been particularly good at being 'girly' and tend to always choose comfort over style in clothes. I am, however, someone who loves shoes (clunky, non-heeled ones), and cool eyeglasses, oh, and scarfs, and chunky necklaces. I like my accessories. Mmmmmm, coffee. Can't say which I love more: my coffee or our bikes. ROBOTS!!! I had so much fun choosing the design to change from the polka dots to these robots. 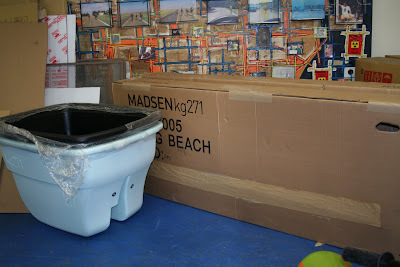 We use these great wall decals that can be cleanly removed when we are ready to redecorate our cargo box. I did the change-over on Halloween Eve under the cover of darkness once the boys headed to bed so they got a cool Halloween morn surprise. 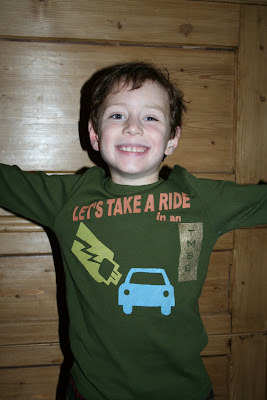 Each time we opt to ride our bikes instead of taking the car, we are glad. There are moments of rushing around, of cold or rainy weather, or of pure exhaustion when we ask ourselves, "Should we just take the car this morning?" However, we have remained true to our commitment-- if we can ride there, we will. Really, every time I reach our destination and I hop off my bike, I find myself so glad that we arrived by pedal power. Two weeks ago, we spent an incredible day downtown. The older boys rode their own bikes (wow!) while we loaded F's balance bike in the Xtracycle. Originally, we thought we would head to the bike path so the guys could ride there for a bit. However, we were hungry so headed downtown first to get a bite to eat. It was such a beautiful day that once we arrived downtown, we found a quiet spot on campus close to food shops where the boys could ride loops and loops around these trees and we could get lunch and picnic outside. It was so great to watch each of the guys enjoying his own bike. F's getting really adept on his balance bike. I suspect he'll be the one to learn to ride without ever using training wheels. S got really into riding that day and looped round and round, counting 112 laps when it was all over... and he still rode home. We had a week of particularly cold weather, and I am learning about dressing myself-- and my sons-- for our fall bike commuting. Each time I read about Miss Sarah up in Canada or Dottie in Chicago, I think that I really don't have any cause to kvetch too much about riding in this Northeast weather. 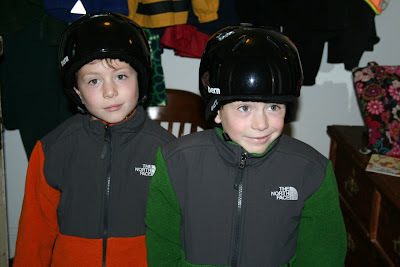 After complaints last year of cold ears, I did buy each of the boys new Bern helmets with fuzzy ear coverings. Warm ears make for such a happier commute. It was great to have a really beautiful, truly autumn (not winteresque) day this past weekend. 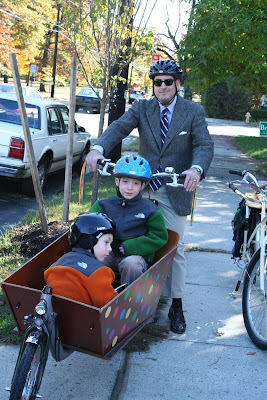 I like to call this snap of P the"Tweed Ride of One," but really, there were five of us heading off to church. He was the only one wearing tweed though. 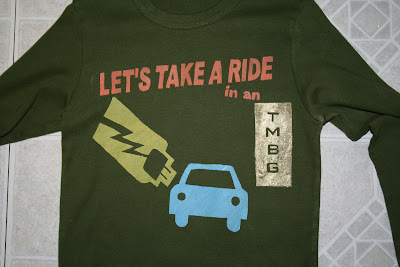 Inspired by They Might Be Giants' new album, Here Comes Science, I handmade three concert t-shirts for my fellas for our concert experience this afternoon down at NYU's Skirball Center. Fun, fun, fun. We all clapped our hands, stomped our feet, jumped in the air, & sang out. These guys are clever, funny, great musicians, and rockin' entertainers. P and I and all the other parents with kids our boys' ages are MOST grateful they started writing and recording kids' music. 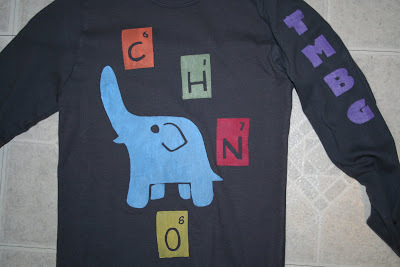 Inspired by Meet the Elements: ""Elephants are mostly made of four elements/ And every living thing is mostly made of four elements/ Plants, bugs, birds, fish, bacteria, & man/Are mostly carbon, hydrogen, nitrogen, & oxygen." Reflecting the lyrics F's favorite song from the album-- I am a Palentologist. The horn parts of Electric Car are truly brilliant. These guys, Nada Surf, will be playing with our family's most-listened-to group, They Might Be Giants, for a benefit in Brooklyn in the coming weeks. I just watched this video and am giving a nod out to my husband for his former days as a bike messenger in NYC. 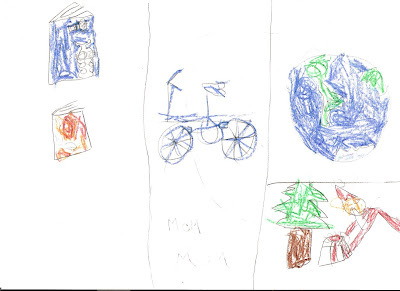 Sara thinks bike commuting with kids can be good for one's self-esteem. 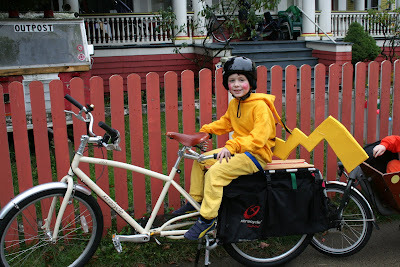 While riding to school today with two boys sitting on the snapdeck of the Xtracycle, a woman rolled up beside her in a fancy gold car and said, "I just have to tell you-- You are fabulous!" 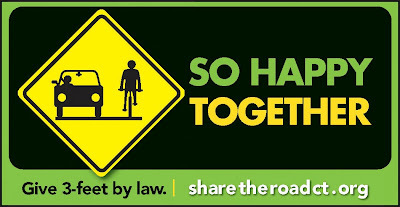 Cycling downtown this afternoon, I stopped behind a public bus and got a glimpse of CT DOT's new ad campaign with a car and a bike pictured and a saying that reads: 3FT IS NOT JUST A CUSHION. IT'S THE LAW. Too bad I didn't have a camera handy to capture the image but I will be on the look-out to do so at another time. Yesterday, I woke up in the morning to C standing by the windows in my bedroom, looking out at the raging storm. "I'm really sorry, Mom," he sighed, "but it's thunder and lightening and it looks like we are going to have to take the car to school today. I'm really sorry we can't ride our bike." when you're riding down the street, it's the people that you meet each day!" With apologies to the tunemakers of Sesame Street, I couldn't help but alter this line from "Who are the People in Your Neighborhood?" when thinking about my latest post. Anyone who spends time on a bike probably has a long list of why s/he rides. I know I do. I can talk about the fun, the easier parking, the savings on gas, lessening my carbon footprint, getting exercise, modeling a good habit to my kids, and on and on. Kerri was riding along Ocean Avenue on her much-loved and well-used Xtracycle when I was loitering on the sidewalk near the beach while on a short vacation in Bradley Beach, NJ. I couldn't help but get excited by her bike and I called out, "Hey, Xtracycle!" when Kerri heard me and actually turned around to say hello. While I was holding a squirming F, she and I got to chat just for a short bit and I heard some of her story. Kerri told me that she was surprised to hear someone randomly call out "Xtracycle" since she's had hers for years but hasn't run into too many other Xtra owners in her corner of the Jersey Shore. It turns out that Kerri is hard-core committed to bikes, promoting cycling, and recycling used bikes. 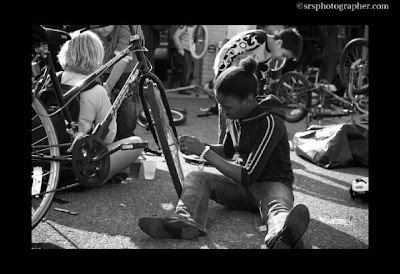 To that end, she runs TWO amazing nonprofits called The Bike Church and Second Life Bikes that serve various-aged kids from Asbury Park. 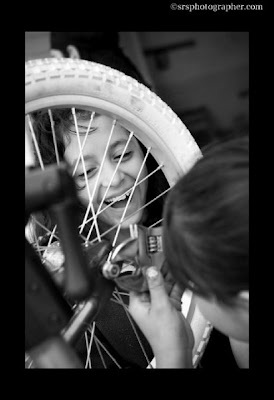 Kids learn to ride, get lessons about bike safety, practice basic bike repair, and earn their very own bikes by putting in 'work hours' through her programs. Read about her mission and kids here and here. 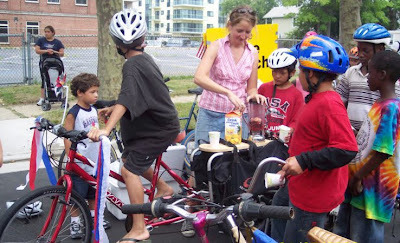 Ever-cool Kerri also has a pedal-powered blender rigged on the back of her xtra so kids can pedal their way to healthy smoothies using their own power. Love this! I wish I had gotten the chance to check out Kerri's programs first-hand and when I am back down the Jersey Shore I hope I can. Meeting Kerri has inspired me to find out if my city has a similiar earn-a-bike program targeted for kids from low-income backgrounds. In the meantime, I am so thankful that our paths crossed and I send a big shout-out to Kerri for allowing me to write about her and for turning her bike around to stop and talk with the crazy woman who yelled out "Hey, Xtracycle!" as she rode by. 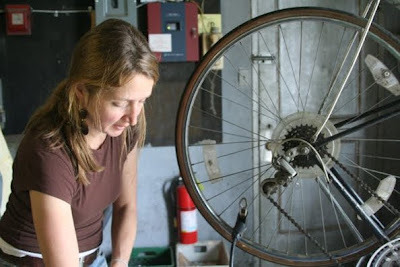 Kerri is still doing amazing work at Second Life Bikes. She has an awesome website and they have recently launched a crowd-funding campaign with a big goal-- BUY the building where they currently are. I would so love to see Kerri be able to continue to do the great work she's been doing in the site where she's been doing it. A perfect holiday gift, perhaps, for someone who doesn't need more stuff but is all into kiddos and bikes? A big shout-out to Elly Blue from bikeportland.org. You may remember Elly from my wonderful encounter with her some time ago. These are here snaps and here is her story of the amazing Hopworksfiets. Did Julia Child Ride a Bike? I actually spent a bit of time trying to find this out via internet searches, just hoping I could find some image of Julia Child cruising along on some perfectly sophisticated European Roadster. I could picture this image in my head, but alas, it wasn't to be found (on the web anyway). Why would I ask such a query anyway? For a long time (years), P and I talked about trying to employ a babysitter for a regular weekly night out. For a variety of reasons, we were never particularly successful in following through on this plan. After a summer with tons of boy care and only one night out, we decided to make it a priority this fall so on Thursday night we welcomed our new babysitter and hopped on our bikes for a date night downtown. I've been struggling with sleep issues lately so I must admit that when the night-out opportunity rolled around, I almost balked in favor of an early bedtime. Instead, I asked P if we could keep it low-key, going to a movie so we could just sit and hang together in the theater, something we hadn't done for about six months. We did a search for local movie times and saw that Julie and Julia was still playing, a film that interested both of us. After talking through the bedtime ritual with the sitter, we packed up our bike lights and pedaled off. We had less than an hour before the movie began so decided to hit a pub a block from the movies for a beer and a quick appetizer, instead of a full-blown meal. When we rode up to the cinema, we were surprised that many of the parking meters were already strapped with bikes so we needed to hunt around a bit for bike parking, a problem we rarely encounter. After getting our tickets, we were directed to the theater where our film was showing. When we opened the door and saw the majority of seats filled with people, it struck me as strange given that the film had been out for some time so I hadn't expected such a large audience. We hunted for seats and ended up walking to the front rows, climbed over some folks sitting on the aisles, and settled into the middle of the third row when a woman got up with a microphone. P and I glanced at each other quickly, wondering if we had somehow gotten the show or the theater wrong, when he looked over my shoulder and was surprised and then absolutely delighted to see the famous chef, Jacques Pepin, Julia's old cooking partner. 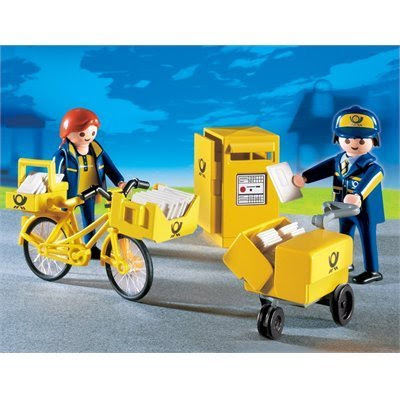 It's a toy cargo bike, hard at work carrying mail, brought to you by the folks at Playmobil. Gotta to admit that our older guys were never Playmobil fellas so I didn't know much about this toy company. However, I immediately suspected it was European: mail carriers, readying to distribute their mail by bike and by foot, and nary a helmet in site (although the gentleman's plastic cap on the right just may do the trick). Sure enough, Playmobil is a family-owned company from Germany, and while I was checking it out on the web, I found this interesting article. As for the present buying, we ended up going for the pirate ship as F has become quite obsessed with these sea-faring vandals. Mostly I think he likes wearing hats and eye patches and yelling "Arrrr!" but perhaps I will head back to the store for a toy just for me. 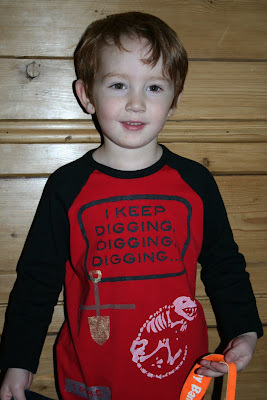 Our youngest, F, headed off to preschool this morning. While neither of the two schools our sons attend are far from our home, they happen to be in opposite directions. Normally P and I divide and conquer: I take S and C to school-- since I do happen to work there as well, it sort of makes sense :) -- while P deals with getting the little guy out. On first days, however, P and I are both interested in being a part of it so we had to make some adjustments today. 1. Twins in the bakfiets. F on the Xtracycle Radish. We all ride to the twins' school, park bikes, and walk the fellas to their classrooms. 2. F in bakfiets, me solo on Radish. Ride back to home. 3. Exchange bakfiets, which is way too heavy to get up the killer hill that F's preschool sits on, for the Rudge Roadster which has a baby/toddler seat on the back. F decides to hang in the toddler seat and we load of the Radish with all his stuff: extra clothes, sleep items, slippers, etc. Good thing we have the extra storage space because no ordinary bike could handle the list of required gear. Yes, we are our children's roadies. 4. Head up the hill. P makes it all the way on the 1967 Rudge with F on the back. I climb off the Xtracycle and walk halfway. Park and walk F into his room. 5. After a few kisses good-bye (I could have used more), I climb back on the Xtracycle, whoosh down the hill, and ride back to the first school to begin work. 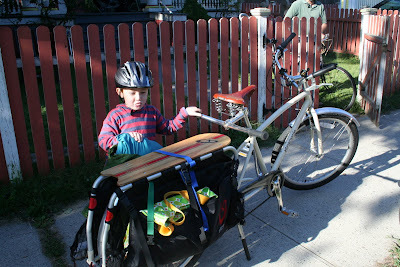 F helps load the Xtracycle with all his preschool-required gear. Packing for college just might be easier. P and F on the Rudge Roadster. F's days in that seat are really limited. 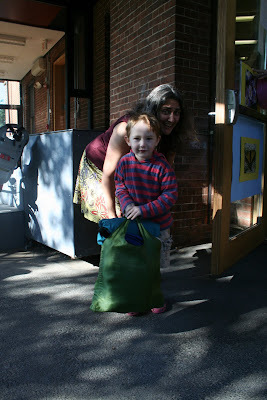 F, with one of his teachers, happily lugs some of his stuff into school. 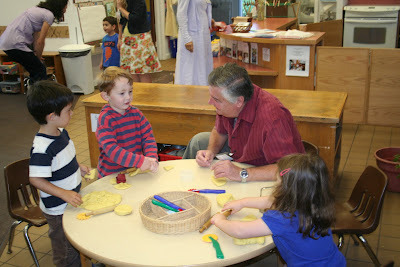 F gets busy making playdoh pizza with his classmates and another teacher. Doesn't worry too much about his parents heading out... or not at all. Submit Your Photos. I Know I Will! The Alliance for Biking and Walking are doing this incredibly cool photo contest, The People Powered Movement Photo Contest. I know I will be sending in photos of my crew out on our cargo bikes, and I hope you send your best snaps in as well. And yes, if you do win the bike tour in Tuscany, you can take me along! People Powered Movement Photo Contest from AllianceBikeWalk on Vimeo. 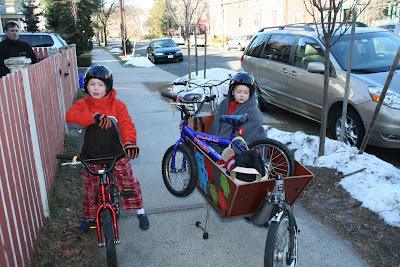 A year ago, we hadn't yet figured out the just-about-two-mile-commute-to-school-so-we-really-have-no-business-taking-the-car-but-it-is-too-far-for-my-guys-to-ride-or-walk situation. 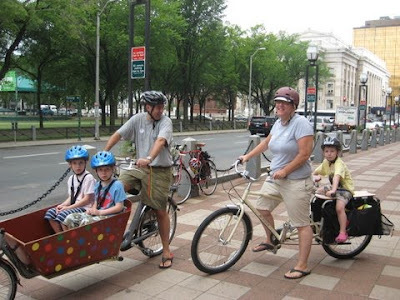 It became our biggest motivator that led us to discover cargo bikes and family cycling. You can read about our journey to finding our first cargo bike, the Bakfiets, here. So this morning marked a few firsts: The first day of first grade for two of my fellows (wow!) and our first day of first-day-of-school bike commuting. (We've been bike commuting to school since March). I was supremely nervous about our get-out time this morning. 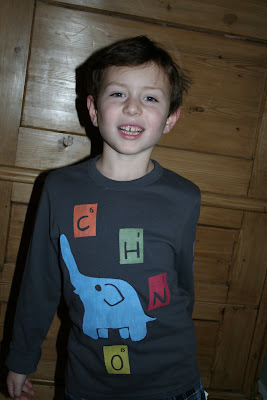 The boys don't sleep particularly late but we've been having relatively leisurely mornings, in terms of getting breakfast and getting dressed, this summer. Just thinking about getting up and out with full bellies, in clean clothes, and with lunches packed was daunting. I let myself ponder-- for a moment-- that if we were not biking to school, we would have more flexibility about when we could leave the apartment and still get to school on time. The two school boys were up and rarin' to go. Would it be too much to hope that they feel like this every first day of a new school year? Unfortunately, the preschooler, who doesn't start school until later this week and was up at 3:30AM visiting our room, had an extraordinarily rough morning. I got a little crazed, begging him -- to no avail, of course-- to stop crying, and announcing testily numerous times to no one particular that we were past our 'safe' leave time. In the end, we all got the new first graders to school on time. But with all my craziness and rushing, we didn't quite capture that moment on film. Here we are, however, at PICK-UP on the first day of school. Update: I emailed the reporter and she kindly sent me these photos below. 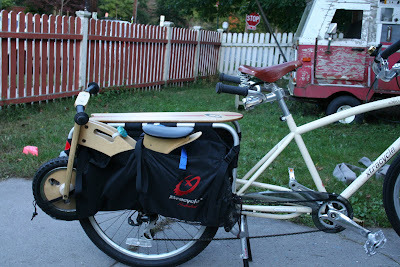 I gotta say that F is looking particularly cute on the back of the Xtracycle and yes, S is looking awfully pissed. He wasn't that into the Bike-To-Work Breakfast that day-- perhaps for its lack of chocolate munchkins. I also need to comment on one of the comments on the New Haven Independent's small article that accompanied the photo. We know we are not allowed to ride on sidewalks. We are hyper-aware of the bike laws in New Haven and try to be ever-vigilant about always following them. We want to make this area ever-more bike friendly and safe so we believe that we must do our part by being law-abiding and courteous cyclists. We often have one, two, or three passengers on our bikes that we are most interested in keeping safe so follow all laws closely. We were simply on the sidewalk for the photo and as the breakfast was held on the sidewalk in front of City Hall, we had to saddle up somewhere. OK, I'll stop now. I didn't bother saying that on the actual New Haven Independent's website comments but hey, I said it here. I tend to get worked up when I read all the nasty back-and-forth comments readers of that online paper seem to generate. Of course, I always to continue to read the comments which I should just stop doing, especially on the bicycle articles that always get down-and-dirty comments between annoyed motorists and intense cyclists. Interesting article by "The Ethicist" in the NYTimes about anonymous blogger comments that you might be interested in checking out. 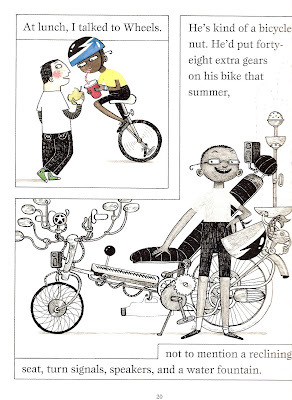 Bikes in Newspapers and Books and Everywhere! Today's Sunday Styles of the NYTimes shows the fun of commuting to work by bike and just how stylish one can be on wheels. Check out Happy Trails now! The sight of the car makes her feel weighted down, flightless, encumbered as a fruitcake. She wishes it away because it obstructs her view of the wildflowers, and because of where it demands she take herself. It's not that she cannot drive. It's that driving fast, and life, savored well, ought to be slow, even its fast moments taken not too seriously if at all possible (p 66). Bicycling is an enjoyable, inexpensive, efficient and environmentally friendly mode of transportation. In order to expand and improve safe and convenient access to this means of mobility, exercise and leisure, the City has made the provision of bicycle accommodations a high priority. It will be interesting to see just how the City supports cyclists. I was riding the bakfiets today with two of my fellows inside the cargo box when we passed a construction site where it was obviously break-time as the road was lined with lunching hard-hatted folks. In the two years we've lived here, it's been clear that Yale is continuously undergoing renovations and the re-routing of traffic to accommodate building is constant. 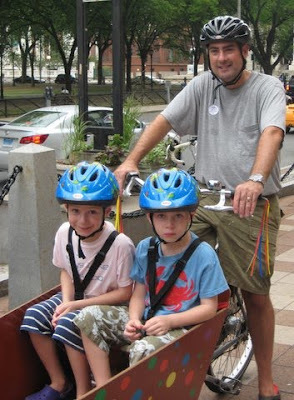 As I was stopped at a red light at a busy corner in the midst of yet-another university renovation, I could overhear some of the workers' discussion about our cargo bike and how "absolutely unsafe it is" that I ride with my children. I left the intersection fuming. I am a cautious rider, one to always obey traffic rules and be hyper-aware of cars. The only reason why biking with my kids would be unsafe, I thought to myself as I pedaled away from the negative talk, has everything to do with cars and drivers. To quote a certain well-known cyclist: It's not about the bike. Anyhoo-- here are a few snaps of some local fun bike times we've recently had. A night out with my friend C-- another mama of twins (one-year-olds!) and a singleton (6 1/2). We decided to head downtown for a kids-free evening and when I suggested we go by bike, C was up for it. 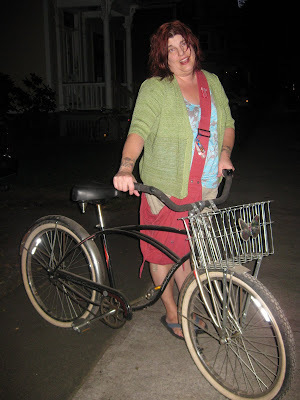 Her sweet husband headed down to the basement and lugged her much-loved Schwinn up the stairs. C said that she used to ride it all the time when she owned her shoe store but her lovely Schwinn had been hanging by itself downstairs for some years. Friday night's pizza night in our home. 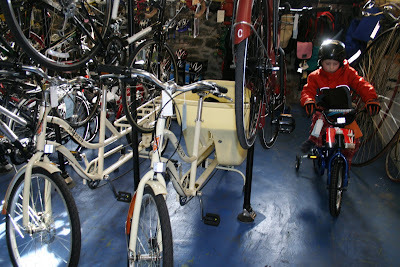 We've always made the weekly run in the box bike b/c the storage is easy. Clearly though, the Radish will work just fine on future Friday evenings. This summer, I have spotted two, yes, TWO work cycles! (I told you we aren't Portland.) 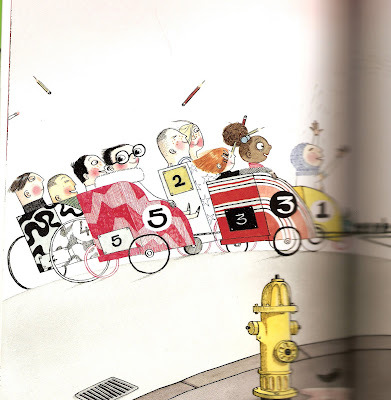 I spied an old-school ice cream trike traveling up the road a couple of weeks ago but wasn't fast enough to get a photo. 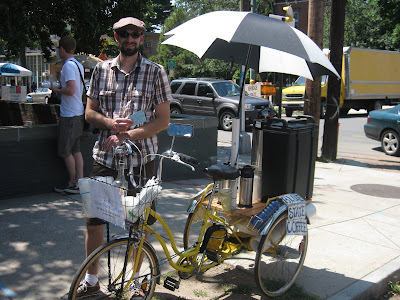 However, I was delighted to come across Blue State Coffee's coffee trike this week. 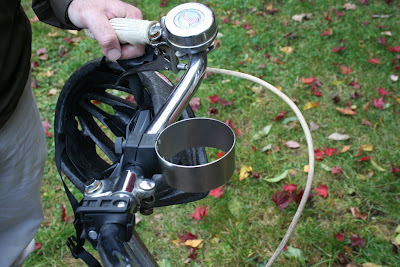 Coffee + Bikes= two of my FAVORITE things in the world. 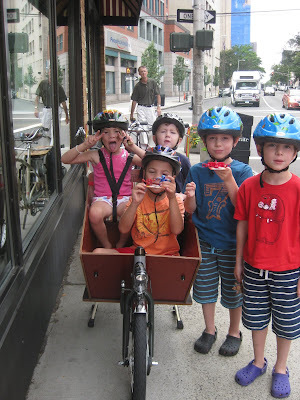 Five kids on two cargo bikes. This week, we enjoyed hanging with two friends for the day. 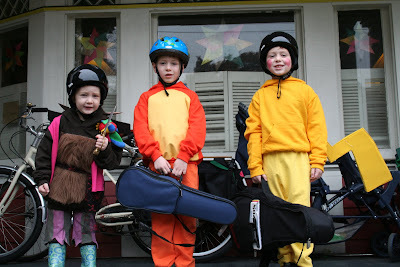 When their parents asked what the kids should pack, we asked them to bring their bicycle helmets. We started the morning with a trip downtown for bagels. My fellows, S & C, traveled with me on the back of the xtracycle while P took F and our two friends in the bakfiets. No minivan needed. Cool.